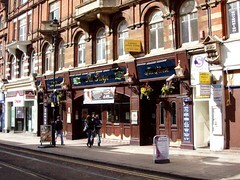 Wetherspoons pub in Croydon, in the Good Beer Guide. It's right next to George Street Tram Stop. It's a fairly typical shop-conversion Wetherspoons inside, though it does go back further than one might expect; the large booth-lined area at the back even has its own bar. Food is served all day from a chain-wide menu which includes a few vegetarian, vegan, and gluten-free options. On our January 2015 visit the real ales were mainly golden ales, though they did have Oakham Opportunist on too (£2.70/pint), a dark ale with an unfortunately sexist pump clip. Service was efficient, and food arrived swiftly too. A jacket potato with five-bean chilli had a nicely chewy skin, but the interior of the potato was watery and mushy. Child-friendliness: There's a pull-down baby change table in the ladies' (gents' not checked). Accessibility: No steps to get in, and it's step-free to all the seating (via a ramp for the back part). There's a RADAR-locked accessible toilet on the ground floor, though access to this is often cluttered with people. There's also step-free access to the ladies' (gents' not checked). Last visited by Kake and other attendees of the Croydon Fun Weekend, January 2016. Opening times taken from the Wetherspoons website, July 2016. Last edited 2018-11-10 14:05:26 (version 19; diff). List all versions. Page last edited 2018-11-10 14:05:26 (version 19).